Leather upper, synthetic lining, ankle boot shoe with rubber/ P. V. C. / P. U. & T. P. R. Sole (by handmade process with steel toe). Backed by rich industry experience, we are highly engaged in manufacturing, exporting and supplying extensive range of Shoes of outstanding quality. 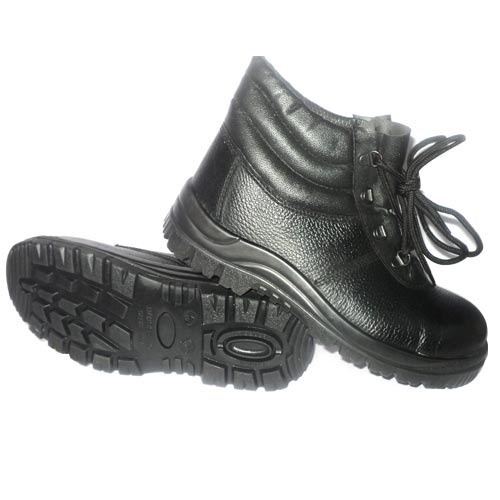 Our range of products comprises of Safety Shoes, Safety Shoe for Labour, Sock Proof Shoes, Acid Resistance Shoe, Gum Boot and Heat resistant safety shoes. These are manufactured using the finest quality raw material and are in total compliance with the set industry norms. Also, the raw materials used in our products are procured from certified and reputed vendors of the market. The offered products are widely used and are highly appreciated by our customers due to their brilliant finishing, durability and high quality. We are providing these products to our customers as per their specific requirements and also at affordable price range. We are backed by sound and sophisticated infrastructure and as a result we are able to meet the expectation and the requirements of the customers. In addition, we have with us a team of highly experienced professionals who are totally involved to provide our customers the finest quality every time. Our organization follows a set of particular quality policies to maintain the quality of the products, thus providing quality satisfaction.